Ewa Jasiewicz is a Palestine solidarity activist, union organiser and part of the editorial collective of Le Monde Diplomatique Polish Edition. 12 October 2018 Ewa Jasiewicz explores the complex interplay of class and gender in Pawlikowski's stunning new film. 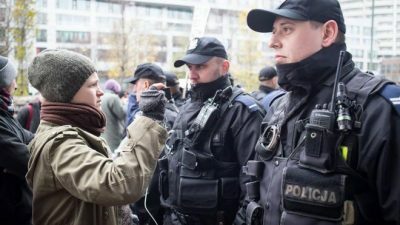 27 November 2017 Last month's mass far right demonstration can be linked to a toxic mix of government tolerance of fascism and neoliberalism on steroids. Ewa Jasiewicz investigates. 14 November 2013 A police raid exposing the scale of worker surveillance within the construction industry galvanised workers to take action. Ewa Jasiewicz speaks to those organising against the blacklisters. 11 August 2013 Ewa Jasiewicz discovers an unexpected symbol of the Syrian revolution in the fourth part of her blog series. 9 August 2013 The second blog in a series on Ewa Jasiewicz's trip to Syria, tells us the dramatic story of Masoud. 29 September 2012 Cuts Cafe opens its doors on October 5th, Ewa Jasiewicz explains what will be happening in the cafe.